This website focuses on the two types of dialysis that are used by the majority of patients with kidney failure: in-center hemodialysis (HD) and peritoneal dialysis (PD). 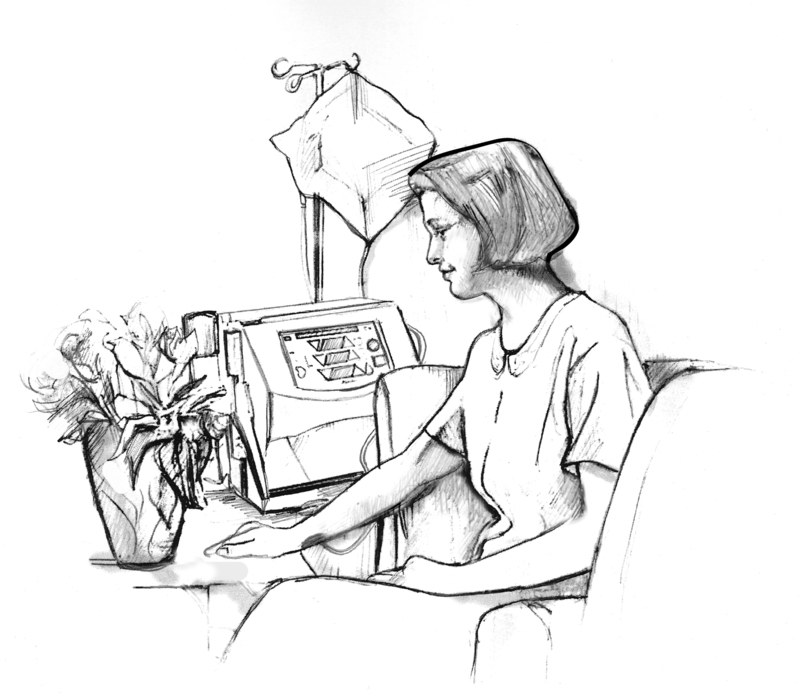 Here is some useful information on another type of hemodialysis: home hemodialysis (HHD). What is Home Hemodialysis (HHD)? Just like in-center, HHD uses a machine to purify the blood. The machine takes blood out of the body, filters out wastes and excess fluid, and returns the cleaned blood back into the body. HHD is done in the home. It is designed to be somewhat portable, so with advanced planning, you can dialyze wherever you are (e.g. in a hotel room, visiting family and friends). If you choose HHD, you and/or your care partner will be responsible for performing your own treatment. Before starting HHD you will receive extensive training until you are comfortable with the entire treatment process. A partner (often a loved one) may help you with some parts of the procedure, depending on your abilities. A member of your health care team will be available by phone, and you will go to the clinic for appointments, usually once a month. Rules about whether a partner is required for HHD vary by state. Talk to your care provider about requirements in your state. The procedure is the same as in-center HD. In HHD, the patient is responsible for setting up the dialysis machine, inserting needles in a fistula or graft, and performing the treatment. A care partner may help with these activities. It is important that you and your care partner discuss and share responsibilities in a way that works best for both of you, and recognize that responsibilities can change over time. There is a lot of training for HHD. My husband and I felt like we were studying for exams. The clinic staff really wanted to make sure that we would be able to manage my treatment at home. Of course, inserting needles into your arm, or any other part of your body for that matter, can be scary, and yes, even painful for a few precious seconds. But think of it this way: those two needles will be giving you the freedom to live your daily life as best as you can, for as long as you can. Prepares supplies needed and sets up the dialysis machine. Measures his/her blood pressure and weight and records them. Washes hands and fistula/graft with soap and water. Sits in a comfortable chair or lays in bed in the room that is equipped for home HD. Disinfects skin, and inserts two large needles into fistula or graft. Patients may feel cold during HHD. Low blood pressure and leg cramping are usually less common for patients on HHD. Stops the dialysis machine and disconnects the blood lines. Holds gauze over the needle holes until they stop bleeding, which sometimes can take up to 10 minutes. HHD allows flexibility in terms of frequency and duration of treatment sessions and can be adapted to a person’s life (e.g. school/work, travel). You and your care team will develop a dialysis prescription (number of treatments per week, duration of each treatment, and settings on the machine) that fits each patient’s specific needs. Some people need HHD every other day, while others dialyze at home more frequently, up to 6 -7 days a week. The duration of each treatment session may be shorter (e.g. 2.5 hours) for patients who dialyze more frequently. Some patients dialyze at night while they sleep, and the treatment lasts for 8-10 hours. While HHD affords the patient the independence to choose when and where to dialyze, it is very important that patients follow their prescribed schedule. HHD gave me more independence and freedom in daily life but I had to be more disciplined to manage my own care. I would record things during my sessions like my blood pressure and how I felt. I would then call-in and talk to my doctor or nurse regularly to check to see if there was anything else I should be doing or watching out for. Side effects of HHD are the same as in-center HD. Here too, patients may experience pain when they insert the needles; changes in blood pressure and cramping are less common. Because the treatments are tailored specifically for each individual, patients on HHD generally feel better after treatment. Home dialyzors report that they are not as tired as many in-center HD patients and do not need to rest as much. Often HHD patients choose to perform their treatment in the evenings, so that they can continue their jobs/other activities during the day and can sleep right after dialysis. It is very important that HHD patients perform all the procedures as they have been trained to do, to minimize the risk of infections; they also need to watch for signs of infection, which may include fever, chills, irritated skin, and blood or pus around the access sites. Any type of dialysis, including HHD, will require some adjustments to everyday life; these changes (for example, changes in diet) are described in the section on Lifestyle Changes. Everything about dialysis is scary, initially. It is a journey and you build confidence and become more tuned in with your body. I have now become more assertive and feel comfortable talking to my doctors and nurses about what I know about my body. To perform HHD, you will need access to purified water and a reliable electrical system. Your care team will visit your home to make sure everything is adequately prepared for your treatments. This may include checking your electrical and plumbing systems to be sure they will support HHD. Usually patients on HHD choose one room in the house where they perform their treatment. It is very important to have a clean environment to help to prevent infections. However, having pets is not a deterrent to HHD; your care team will discuss extra precautions needed when there are pets in the home. People on HHD will need space at home to store supplies. HHD supplies are delivered in boxes that are similar to the weight and size of boxes that contain printer paper. I found creative ways to store my supplies so that my home wouldn't feel like a clinic. The dialysis machine must be set up in a room with adequate electrical and water supply (e.g. family room, bedroom). Staff from your clinic will visit your home to make sure that your electrical and water lines are suitable for HHD. Some HHD machines can be transported with you when you travel, if you have a clean environment (for example, a hotel room) and the appropriate supplies. People on HHD should talk first to their health care team and work together to plan their travel requirements. CAPD is usually done 3 to 4 times each day. Each exchange takes about 30 minutes. APD is done while the person sleeps, usually for 8 to 12 hours. We’d like to thank Home Dialyzors United, the American Association of Kidney Patients, the National Kidney Foundation, and the EPOCH-RRT Advisory Panel for their insight and careful review of the information presented here. For more information, please visit the Additional Resources page. Research described on this web site was partially funded through a Patient-Centered Outcomes Research Institute (PCORI) Award (1109). The statements and views presented here are solely the responsibility of the authors and do not necessarily represent the views of the Patient-Centered Outcomes Research Institute (PCORI), its Board of Governors or Methodology Committee.